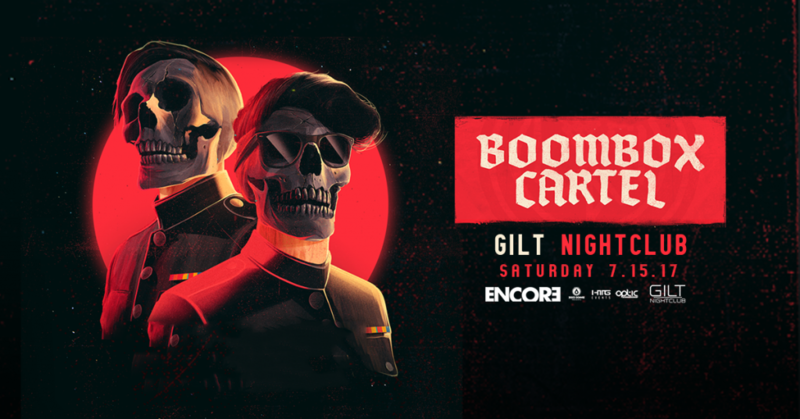 HTG Events, Gilt, & DDP will be hosting Boombox Cartel in Orlando on July 22nd 2017 at Gilt! Follow the link for event and ticketing information. Mexican born producer/DJ’s Americo Garcia and Jorge Medina have quickly risen as one of the most anticipated new duos in the electronic space with their unique low end, heavy genre-blending sound. THEIR TRACKS are played out all over the world by the likes of RL Grime, Diplo, Skrillex, DJ Snake and have received support from Mad Decent, Billboard, Noisey, ThisSongIsSick, Complex + many more. Their global tour has included sold out performances in the U.S., Canada, Australia, and Asia, including festival plays at MOONRISE, Global Dance, Lollapalooza and EDC just to name a few. Mexican born producer/DJ's Americo Garcia and Jorge Medina have quickly risen as one of the most anticipated new duos in the electronic space with their unique low end, heavy genre-blending sound. THEIR TRACKS are played out all over the world by the likes of RL Grime, Diplo, Skrillex, DJ Snake and have received support from Mad Decent, Billboard, Noisey, ThisSongIsSick, Complex + many more. Their global tour has included sold out performances in the U.S., Canada, Australia, and Asia, including festival plays at MOONRISE, Global Dance, Lollapalooza and EDC just to name a few.